You can usually restore deleted or lost files if you act quickly and carefully. Data recovery is the process of recovering (retrieving) inaccessible, lost, corrupted, damaged or formatted data from a computer's hard drive or an external storage device, such as an SD card, USB flash drive or external hard drive. When files have been accidentally deleted, the contents of deleted files are not removed immediately from the physical drive – instead, references to the files are removed in the directory structure, and thereafter the disk space of the deleted files is made available for later data overwriting. Deleted files can't be discoverable through a standard file manager, like Windows Explorer, but the deleted data still technically exists on the physical drive and if you act quickly and carefully you might still be able to recover your deleted data. Documents: DOC, DOCX, XLS, XLSX, PDF, TXT, etc. Audio: MP3, WMA, WAV, FLAC, AAC, CDA, OGG, etc. Videos: MP4, AVI, WMV, FLV, MKV, DIVX, MOV, 3GP, MPG, SWF, ASF, etc. Compressed: ZIP, RAR, 7Z, TAR, GZ, etc. Web: HTML, PHP, XML, CSS, etc. When you delete a file, Windows will mark the disk space of the file as free disk space on your hard drive. Your file is still located somewhere on the hard drive, but Windows can overwrite the file with new data and this will make the file recovery process more difficult or even impossible. The best and safest thing to do is to use your PC as little as possible. Turn off your internet connection, so that Windows will not automatically download and install updates. Don't install any software (even data recovery software) on your computer. Windows stores deleted files and folders in the Recycle Bin as a safety measure. 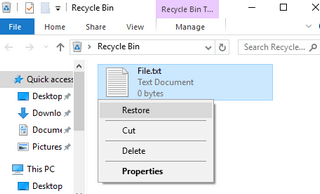 If you find your file or folder in the Recycle Bin, then right-click on it and choose Restore. If you back up your data on a regular basis, then your file is probably preserved there. If you don't back up your data, then I recommend you to start backing up your data immediately. Maybe you've stored a copy of your file in a cloud storage service, like Dropbox, Google Drive or Microsoft OneDrive. You should also check the Recycle Bin (Trash) of your cloud storage service. 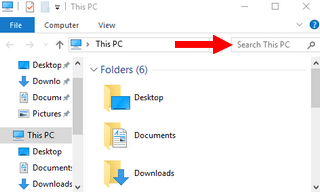 If you're not sure if you've deleted, moved or copied the file, then search for your file using the search box in Windows Explorer or File Explorer (Windows 10). Hopefully, the file was accidentally moved to another location on your PC or maybe you've made a copy of the file and saved it to another location on your PC. You can also try to find your lost data with the Windows "Restore Previous Versions" feature. 1. Open Windows Explorer or File Explorer (Windows 10). 2. Right-click on the folder (that contained the file(s) you've deleted) and choose Properties. 3. Click on the Previous Versions tab. 4. Select the previous version of the folder and click on Open and view it to make sure it's the version you want. 5. Copy or drag the file from the folder to another location on your PC. If you still can't recover your lost data in Windows, then try portable data recovery software. It is important NOT to install any software on your PC. You can download portable data recovery software directly to your USB device and use it to try to find and restore your lost data. For recovering deleted files, I recommend Recuva. Recuva is popular and user-friendly data recovery software that has the ability to restore deleted files from hard drives, CDs, DVDs, SD cards (memory cards), USB flash drives, and external hard drives. Recuva's ability to run without installation is one feature that sets this program apart from others. It's made by the same developers who created Ccleaner. 1. Connect your USB flash drive or external hard drive to your computer. 2. Download the portable version of Recuva directly to your USB device. 3. Open your USB device and unzip (extract) the Recuva .zip file. 4. If you have a 32-bit version of Windows, then double-click on the recuva.exe file and if you have a 64-bit version of Windows, then double-click on the recuva64.exe file. A Welcome to the Recuva Wizard window will appear. 8. Select the location on your computer where the file was stored before it was deleted. 10. You will have the Enable Deep Scan option. If this option is checked, the program will search for your file more thoroughly, but it will take much longer. You can also enable this option if the previous scans have failed to find your file(s). Recuva will now search for your file(s). 12. Recuva will show a list with all the files it could find. 13. Select the file(s) you want to restore. 15. Select a location on your computer where you want to save the file(s). Recuva's portability (the ability to run without installation) is one feature that sets this program apart from others. 1. Connect your SD card (memory card), USB flash drive or external hard drive to your computer. 2. Don't copy anything to your SD card or USB device because this can overwrite your lost data. 3. Download the free version of Recuva here and install it on your PC. You can also download the portable version of Recuva to your PC. 8. Select In a specific location. 9. Click on the Browse button. 10. Select your SD card, USB flash drive or external hard drive. 13. You will have the Enable Deep Scan option. If this option is checked, the program will search for your file more thoroughly, but it will take much longer. You can also enable this option if the previous scans have failed to find your file(s). 15. Recuva will show a list with all the files it could find. 16. Select the file(s) you want to restore. 18. Select a location on your computer where you want to save the file(s).